Backwards delete (delete to the right) – q and then delete – for a short while subsequent delete taps will also delete to the right – wait a short moment and normal delete (to the left) will kick in. Deleting documents now moves them to the ‘Waste bin’. They can then be restored or completely destroyed. This is for anyone who has ever accidentally deleted a vital document, i.e. everyone. Save all your Paragraft documents as a zip file. This can be used to backup your files or to transfer all your files from one device to another in a single operation. The zip file can be kept locally, can be emailed, or can be opened in another application, e.g. Dropbox. Restore selected files from a zip file – files can be restored from locally stored zip files, i.e. stored within Paragraft. Or zip files can be opened from other applications, e.g. Mail or Dropbox. Once ‘imported’ into Paragraft the zip files can be accessed at any time and/or deleted. Support for ‘endnote format’ links – links are in the form [friendly name][ref] or [friendly name] [ref] or [ref]. In the last case ref is also used as the friendly name. Definitions are [ref]: www.obliquely.org.uk or [ref]: http://www.obliquely.org.uk. Paragraft also provides the option to convert existing in-line links to out of line links and vice versa. Option to use out of line or in line linking when pasting a link into a Paragraft document. ‘Keep with next’ for PDF output – headings attempt to hang on to the text that immediately follows them. Improved display of document fragments in document listing. Adjustments to Markdown processing to cope with some less common cases where italic or bold styling was mis-applied. Fixed accuracy problems with word counts on longer documents. Fixed issue where paragraph wouldn’t resize when pasting in links. Fixed am issue where preview display was temporarily dicey after changing the line spacing multiple. 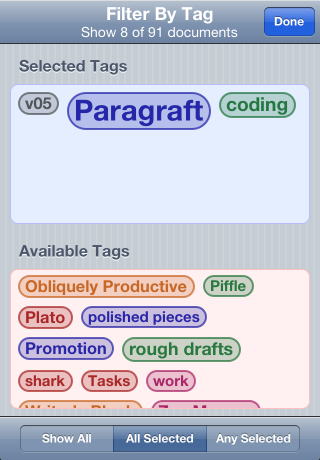 Fixed various issues that arose when using Paragraft with iOS7, including clipped paragraphs during editing. Other miscellaneous bug fixes and stability improvements. This entry was posted in Paragraft on Thu 3 Oct 2013 by Matthew Elton. Paragraft has been updated for iOS 6 and the iPhones / iPod touches with taller displays. There are also a few minor bug fixes – not least for some weirdness that arrived with the iOS 6 update – and one, very modest, new feature. The new feature was suggested by a user who, like me, found the naming new documents to be a bit more troublesome than would be ideal. Since the first line of the document is often a short heading and often a suitable title, Paragraft will now suggest this to you as a title, when you go across to the information page (by tapping on the (i) icon at the bottom right of the editor). Since introducing this on my development build, I’ve begun to wondered how I tolerated the many times I’d either rewritten the title I had just written in the document or, just as tedious, painstakingly copied it from the document and pasted it into the title field on the information page. It’s great to get user feedback. There are several features in Paragraft that have come about directly because of a user suggestion. If you have a good idea, please don’t hesitate to pass it on. This entry was posted in Paragraft on Fri 19 Oct 2012 by Matthew Elton. I really like the tag lozenges in Paragraft. Their creation began with having an idea of how they might look, how they might be dragged between an ‘available’ to a ‘selected’ bucket, and how, with a bit of animation, they might neatly re-order themselves after every disruption. The idea was quickly formed. Then there was the long process of initial implementation followed by the even longer process of debugging and refining the operation of the feature. What looks great in the mind’s eye can all too easily lose its lustre when it’s realised in pixels and code. But I found that months on I was still enjoying tagging my Paragraft documents. Often, I would idly re-order the tags just to watch them do their little dance as they shuffled themselves into their right places. But for all that I liked tagging my documents, over time it began to dawn on me that I just wasn’t making use of the tags for finding my documents. The process felt too fiddly. And so I just didn’t use it. The problem was that although the process of applying tags to a given document was a delight, the process of selecting tags in order to filter the document list was awkward. Of course, describing the problem like this – a description only available in hindsight – immediately suggests a solution: adapt the process of applying tags to a document to the operation of applying tag filters to the document list. After a short burst of intense activity, I had a rough but working version of the new approach. And now I found that I was using tag filtering all the time. Applying tag filters and removing them was quick. And fun: I got to do more dragging of those lozenges and more watching them do their little shuffle dance. This shows all the documents tagged both Paragraft and coding, but excludes any documents tagged v05. an overhaul of the iPad interface so a tag filtering pane was shown side by side with the document list. Of course, what people do and don’t like in a user interface varies a lot. And just because I now feel that the first shot at tag filtering was catastrophically clunky, doesn’t mean this iteration will suit everyone. But I think the odds of it suiting more people are definitely on the up. Paragraft v05 is available now. This entry was posted in Computing, Paragraft on Sun 17 Jun 2012 by Matthew Elton.